A video clip on the charge of the winged Polish hussars on September 12, 1683, 332 years ago, that broke the back of the Turkish army besieging Vienna. 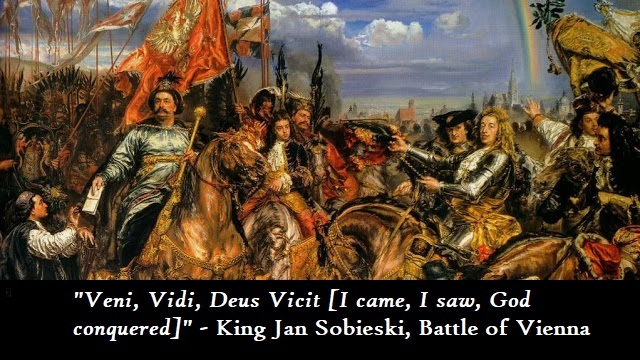 John Sobieski, the Polish King, fifty-four years old, had been fighting the Turks since his youth. College educated at a time when that was rare, he had spent two years traveling in Western Europe. Multi-lingual, in addition to his native Polish he could also speak Latin, German, Italian, French, Tatar and Turkish. A scholar as well as a fighting man, he made a careful study of Turkish military methods. His skill on the battlefield and in diplomacy led to him being crowned King of Poland in 1676. The Immortal God, (to whom Honour and Glory be Ascribed for Ever) has Blest us with so Signal a Victory, as scarce the Memory of Man can Equal: The Enemy was not only content to Raise the Siege of Vienna, and Leave us Masters of the Field; But also of all their Cannon, and Tents, with Inestimable Treasure, and clim’d over Mountains of Carcasses made by their own Body’s in the Flight. My Eyes were never Blest before with so delightful a Prospect as to see my Soldiers follow here a great Drove of their Sheep and Oxen, and there a much greater Herd of Turkish Captives; Nor my Ear’s e’re Charm’d with so pleasing Musick, as the Howlings and Dying Groans of these Miserable Wretches: So great was their Hast, that the Prime Visier almost alone and forsaken of all, was forc’t without the Ceremony of his Turbant, to take his Flight; But yet he left me Heir to his Tent and Riches whith were shewn me by a Renegado of his own Retinue. I have Presented the Turkish Standard to His Holyness, who was Instrumental no less by His Money, than His Prayers, to their Overthrow. The Prime Vizor’s Horse with all his Trappings, I reserv’d for my self; And tho he was so Fortunate in his Flight to Escape us, yet his Caymecam, or Lieutenant-General, with some of the most Considerable Bassa’s [Pashas]fell by our Swords; But the approaching Night put a Stop to our Pursuit, and their Slaughter. Those Janizaries which were left behind in the Mines and Trenches, we thought not worth the dulling of our Swords, therefore we made but one Funeral Pile for ’em all, and Burnt ’em. In the Action there were about Thirty Thousand Turks kill’d; besides Tartars, and One Hundred Thousand Tents taken. Our Souldiers, and the Burghers of Vienna, were Two whole Nights, and One Day, in Rifling their Tents and Body’s, and I believe a Week would scarce suffice to finish it. The Rarities which were found in the Prime Vizor’s Tent, were no less Numerous than Strange and Surprising, as very curious Parrots, and some Birds of Paradise, with all his Banios,and Fountains, and some Ostriches, which he Chose rather to Kill, than let ’em fall Alive into our Hands; Nay his Dispair and Jealousy transported him so far, as to Destroy his very Women for the same Reason. The whole Army Attributes the Glory of this Victory to God, and Us, and all the Princes of the Empire, with the Great Officers, as the Dukes of Bavaria and Lorrain, Prince Waldek, etc. were so far transported with my Valour and Success, that their Thanks and Praises were more Numerous, than was their Fears before; and Count Staremberg the Governour, Saluted me with the Title of his Mighty Deliverer. The Common People in my going to and from the Churches, pay’d their Veneration even to my very Garments, and made their Cry’s and Acclamations reach the Sky, of Long Live the King of Poland. In the battle we Lost some of our Friends, as Prince Halicki, and the Treasurer of our Household. The Reverend Marinus Daviano, heapt on me his Pray’rs and Blessings, and told me he saw a White Dove fluttering o’re the Army, which he look’d upon as an happy Augure of our Victory. We are now on our March towards Hungary; taking the Advantage of their Distraction, to Defeat the Remainder of their scatter’d Troops, and Surprize Gran or Newheufell. I have all the Princes of the Empire my Companions in this Enterprise, who tell me they are ready to follow such a Leader not only into Hungary, but to the End of the World. The Prime Vizor being unable to put a Stop to our Pursuit, told his Eldest Son Mahomet Han, That he must now bid Adieu to all his Greatness, and never expect to be in Safety, whilst their Lye’s one Stone upon another in the Walls of Vienna, but withal bid him hasten to the Grand Seignor and Demand a Speedy Succour, to whom his Son Reply’d, That he knew him too well for that, and there was nothing for ’em now to Rely on but their Flight. I am just now going to take Horse, and all my way for Two Hungarian Miles together, are so strew’d with the Carcasses of Men, Horses, and Camels, that the Stench of ’em would be insupportable to any but a Soldier. I have sent several Dispatches to Forein Princes to give Notice of this Action, but the King of France was forgotten. I Rejoice to see our Son Alexander of so Clear and Undanted a Courage who always stuck to me in my most iminent Dangers: and made the first onset on a Body of Turkish Spahn, with that Courage that he put ’em soon to flight, and Receiv’d the Applauses of the whole Army. He has Contracted a very Intimate Friendship with the young Duke of Bavaria with whom he equally devided the spoyl, This Prince has been very Assiduous in his Services to me; therefore I have presented him three of my Horses, the Bassa of Egypt’s Tent and Standard, and ten Pieces of Cannon. To his Sister the Dauphiness, a Locket of Diamonds. Yet there Remains such heaps of their Colours and Symeters in our possession as are not to be numbred. All my Countrey men March’t with the same Bravery to the Relief of Vienna, as the Souldiers of Godfrey of Bullein did to the Holy Land, and the miraculous Cross that you presented me with [which was his companion in that Expedition]I Believe Contributed no less to our Victory. Thanks be to Heaven, now the Half-Moon Triumphs no longer o’re the Cross, And ’twas thrown down from St. Stephen’s Steeple in Vienna (whom it had o’retopt so long) immediately on the Defeat: Neither have the Turks any occasion to upbraid us with their Blasphemous Mahometan Proverb. ‘Ye Christians where is Your God? Awesome! When the West still believed. Thank you, Donald. One other historical footnote, the Viennese bakers created the croissant in the shape of the muslim crescent moon to celebrate the victory. The bagal was also created in Vienna to celebrate the victory as well. The root word for bagal means stirrup in German. It was created to honor King John ans his Winged Hussars calvary. The Hussar Charge clip, what movie was that from? Better yet, any good movies you could recommend in regards to the Siege of Vienna? The Day of the Siege: September 11, 1683 (2012). There are probably other Polish films on this event, but The Day of the Siege is the only one I am aware of. He was a man who was fit to be king. Most of us today are not even fit to be voters in a republic. The Day of the Siege is the only one I know of in English. There was another English language movie planned but it was canceled. Some tidbits about the times – Jan III Sobieski’s wife was French. The French were enemies of the Habsburgs and they lobbied the Polish nobles heavily not to enter the fight. The Habsburgs were never very popular in the Polish Lithuanian Commonwealth and barely 100 years later joined the Prussians and Russians in wiping the Commonwealth off of the map for 123 years. It was Russian controlled Warsaw that my great grandfather fled for Western Pennsylvania. The Commonwealth (this was a union of what is most of present day Poland, Lithuania, Latvia, Belarus and western Ukraine) was a formidable power but the Swedish Deluge of the 1650s severely weakened the nation and Sobieski was able to turn things around for only a short time. The Commonwealth had religious freedom at a time when belonging to the wrong religion in Western Europe meant death. There were Catholics, Lutherans, Calvinists and Orthodox. The Commonwealth was a safe haven for Jews who were evicted from other parts of Europe. Poland has had a small community of Crimean Tatar Muslims since the 15th century. The Union of Uzhorod (Byzantine Catholic) and Brest-Litovsk (Ukrainian Catholic) took place in the Commonwealth. The Swedes, Germans, Russians and Ottomans were the nearly-constant enemies of the Commonwealth. They caused great damage but never were able to defeat the Commonwealth one on one. Below is a link for Gaude Mater Polonia, the Latin language anthem to the Polish Lithuanian Commonwealth. It is a tribute both to the nation and to God and sung acapella. I could see a bigger Commonwealth if all of Ukraine (not just the western portions) joined. Throw in Lithuania, Latvia, & Belarus & we have a mighty European power. And a very strong buffer state between Western Civilization & the Russian Federation. Maybe even Estonia would join for security alone. It may well allow Finland, Czechia, Slovakia & possibly a resurgent Hungary I Romania to join seeing that Religious freedom is respected. The Muslims in Poland are the descendants of the Tatars & loyal Polish citizens. For centuries I believe they had their own military division in Polish armies. Thanks. I’ll have to look up the movie. There is a 10 video set chronicling the country’s history but it’s in Polish. My husband’s Polish grandparents left Poland in the early 1900s for Canada and thence to Buffalo. They used his wife’s $3,000 dollar dowry to emigrate and buy a farm. Grandfather Andrew did not want to want to fight for the Czar. He’d been drafted into the White Russian army once before. The wings on the Hussars were an early form of psychological warfare. The Turkish’s had their drums which they beat day and night but the sound of the wind ruffling through the feathered wings of the Hussar cavalry when they charged caused real panic among the Turks. My doctor, Gregory Adams, MD went from Poland to Vienna. Anyone going from Poland with a Polish passport to Vienna is given everything free in the city of Vienna to this day, so grateful are they for having been saved from the Muslims. If Vienna fell St. Peters in the Vatican, called the Golden Apple was to be made into a mosque by the Muslims. It is still their plan. 72 virgins without the Blessed Virgin, the Mother of God is a poor deal for any suicide bomber. I am confounded by what any soul would do with 72 virgins. When Catholic souls get to heaven. Catholic souls have all and every virgin and Jesus Christ, true God and true man, our Leader.